Technological breakthroughs using nanotechnology have made direct composites more wear and stain resistant with improved strength. It can now be used to restore front and back teeth that are moderately broken down due to wear, erosion, fracture or tooth decay. In back teeth, composites are completed under Rubber Dam isolation, ensuring contamination free bonding and a longer life for your restoration. We pay strict attention to achieving good contacts between teeth (to avoid food packing whilst making flossing easy) and proper conact with opposing teeth to properly support your bite. 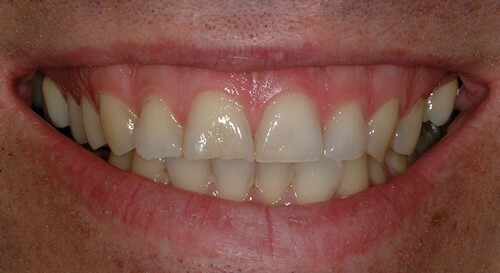 In front teeth, we may use advanced multi-layering techniques to blend the composite invisibly into your smile. 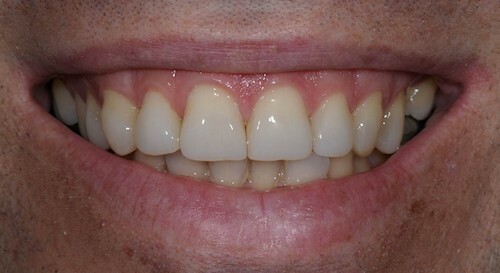 Craig had worn down his upper front teeth through clenching and grinding. He elected to rebuild them to their full original contour with direct nano-composite technology.